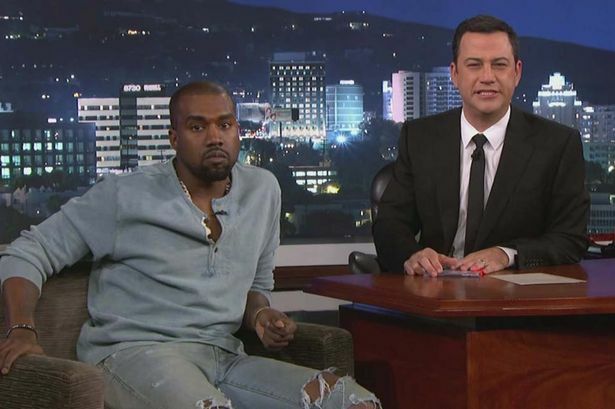 Jimmy Kimmel gave Kanye West almost 30 minutes last night and just pressed play. Kanye did as Kanye does: he performed, he delivered, he entertained. “We are here to entertain you,” he preached. Always. Because whatever your feelings about Kanye – you hate him, you love him, you defend him, you mock him – it’s undeniable that Kanye is never boring. Kanye is Must See TV, any kind of TV – late night talk show TV, documentary interview TV, award show TV, even telethon TV. This is a gift. It’s a gift most of his peers don’t have. If you gave Justin Timberlake 30 minutes to freestyle, unscripted, with no distractions, no background music, no music at all, no moves, and no flash, he couldn’t paralyse you the way Kanye can. Kanye is riveting – whether you actually agree with what he’s saying or not, he is riveting, compelling, arresting, and, again, so f-cking entertaining. So when he classifies himself as “celebrity” along with his girlfriend, when he repeatedly refers to their experience as one that they, “celebrities”, must endure, he’s really doing himself a disservice. No, he is not like them. He is not like the talentless who use the tabloids that are writing about him, reporting on him, troubling him. And yet… that’s actually his family now. “Kris Jenner Exclusive” reads the current cover of US Weekly. Kanye’s not wrong when he says that he’s treated unfairly. He is, often. But he also often behaves unfairly. And unfortunately, because he’s a “celebrity”, he doesn’t have the right people around to challenge his hypocrisies, the right kind of “media” to challenge his hypocrisies. Kanye wanted a platform last night and he found it on Kimmel. During that time, he insisted that all he’s ever wanted was to share his creativity with the world, to send his inspiration out to the people, to elevate us with his art. Fine. But it only works for him when everyone else is receiving and all he’s doing is giving, when the flow only happens in one direction – from Kanye to us. What are the limitations to an artist if that tunnel only runs one way? What are the consequences when an artist only opens up to the opposing force on a selective basis, at a time he determines arbitrarily? By Kanye’s decree, it’s like we must accept his downloads without question, whenever he chooses to send them, but that portal doesn’t remain open for returns and we’re not allowed to complain or criticise. Would you call that artistic dictatorship? Would he? I’m pretty sure that’s not his intention. But I don’t know that there’s anyone around who can actually have that discussion with him. Kanye West could be an entire year at the Faculty of Celebrity Studies, non? More on Kanye later. And a fresh blind.